2019-2020 Season – Positions Available ! 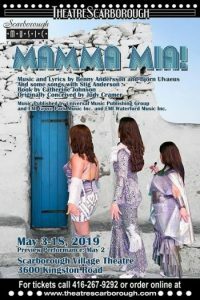 2 EXTRA PERFORMANCES OF MAMMA MIA! spring production is already 65% sold. So we’ve added 2 new performances! The May 11th matinee is also a sing-a-long performance!! Come and join Sophie as she brings three men from her mother’s past back to the Mediterranean paradise they visited 20 years earlier in the hopes of finding her dad to walk her down the aisle. Whether you’re a Dancing Queen or a Super Trouper, the music of ABBA will have you dancing in the aisles and saying Thank You For The Music in this thoroughly entertaining musical tale of one wedding, three fathers, and too many classics of the disco era to count! Join our mailing list to get updates on shows, casting calls and more!